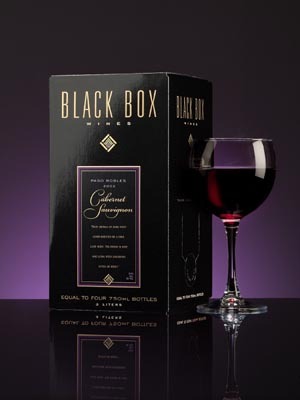 Periodically, we revisit the boxed wine of the ubiquitous Black Box Wines. In the case of Black Box California Cabernet Sauvignon 2007, we’re very glad we did. It’s one of the nicest box wines we’ve tried and definitely as good as a lot of bottle wine costing twice as much. This Cab has a very dark ruby color, with bright berry and clove aromas. Raspberry and strawberry flavors predominate, and the finish is long with chewy tannings and a lingering note of dried fruit. Our history with Black Box Cabs has been mixed. We liked Black Box Paso Robles Cabernet Sauvignon 2004 enough to score it 8.5, but the Black Box 2005 Cab disappointed at a mere 7.5. Happily the 2006 Black Box Paso Robles Cab bounced back to an 8.5. The 2007 California Cabernet Sauvignon, though, was the best of the bunch. I actually scored this box at Sam’s Club for a mere $18 – that’s $4.50 per bottle-equivalent. A pleasant wine and a great value! This entry was posted in Box Wines, Cabernet Sauvignon, Red Wines, Wine Reviews and tagged black box on January 16, 2011 by Roger.